This is what happens at a scratch on painted steel. The exposed steel corrodes and forms a pocket of rust. Because rust is much more voluminous than steel, the pocket swells. 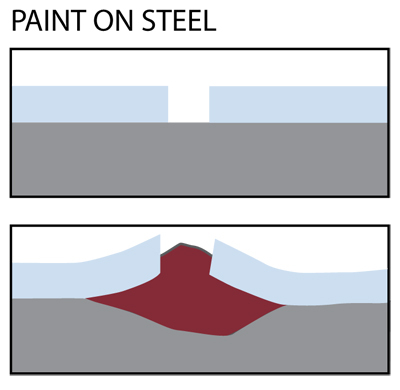 This lifts the paint film from the metal surface to form a blister. Both the corrosion pit and the blister continue to grow. This is what happens at a scratch on galvanized steel. 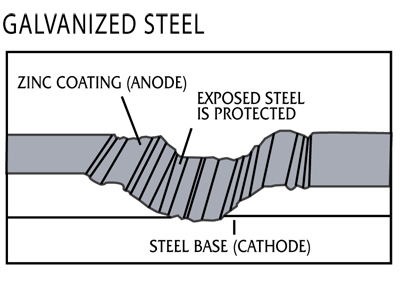 The zinc coating sarifices itself slowly by galvanic action to protect the base steel. This sacrificial action continues as long as any zinc remains in the immediate area. Zinc protects the steel in 2 ways. The first is by barrier protection. Zinc provides a tough metallurgical bonded zinc coating, which completely covers the steel and seals it from the environment.